Renegade politicians whipping up religious hatred are to blame for bloodshed and violence in northern Nigeria according to the local bishop who says the police have failed in their duty to protect the people. Bishop Oliver Dashe Doeme of Maiduguri said local politicians were exploiting the region’s religious divisions to “whip up” anger in a bid to destabilize the region and unseat the government. Speaking on Monday, November 7th, from the region in north-east Nigeria, Bishop Doeme told Catholic charity Aid to the Church in Need (ACN) that the region’s government had “let the people down” by allowing a serious breach of security. Latest reports say that more than 100 people died in the attacks over the weekend, centering on the towns of Damaturu and Patiskum, where bombers targeted mosques, churches and staged gun battles with local police. Bishop Doeme explained how in Damaturu parish priest Father James John and Father Allan, assistant priest, ran for their lives after St. Mary’s Catholic Church was reduced to rubble during a bomb attack on Friday evening, November 4th. His comments come after Islamist group Boko Haram, which means Western education is forbidden, admitted that it was behind the attacks in Damaturu, adding that it planned further violence. Bishop Doeme said Islamist groups had infiltrated parts of the police and other security networks, causing further problems. He added that youth in the region were easily prey for Islamist groups, describing high levels of poverty, poor education and unemployment. The bishop said the violence was the latest in a series of attacks. He reported that St. Mary’s Church was the fifth Catholic building in the diocese to come under attack since March. 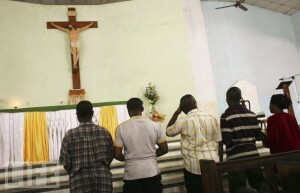 A church in Maiduguri Cathedral Parish came under attack in April and three months later the diocesan curial offices and the neighboring presbytery (priests’ house) were targeted. Three weeks ago another church was burned down by youth.